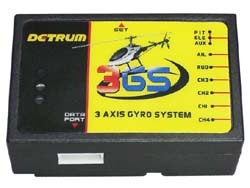 The GY240 is a high performance, compact, and light weight Angular Vector Control System gyro developed specifically for model and micro helicopters. 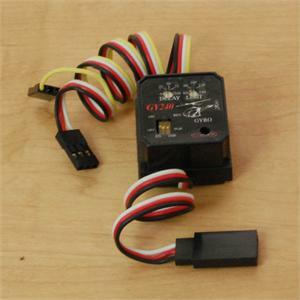 The gyro is compatible to the Spektrum, JR, Futaba or Walkera RX2810PRO receiver. 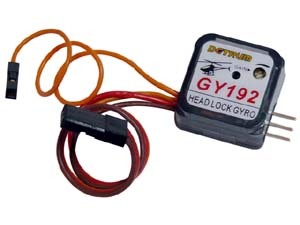 This gyro has all the ccpm mixing and Tail mixing built in, providing your transmitter provides pitch will fit any transmitter. Also will take the Spektrum Satalite direct (you will need the lead). Suitable for Helies, aeroplanes, multicopter. CD with control programme and leads to connect to receiver. 3 axis gyros, requirng minimal set up. 2. 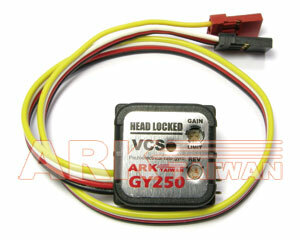 Built-in three-axis gyroscope and three-axis acceleration sensor. 3. support for self-stabilizing, super stable flight performance. 4.Support the general receiver, FUTABA S.BUS receiver, DSM2, DSMX 11MS, DSMX 22MS receiver, simplifying connection installation more convenient, ultra-bright LED. 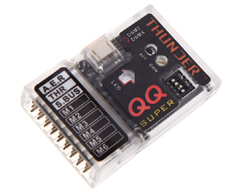 Note: ideal for the beginer into quadcopter, you do not need to programme. Also self stabilising means the quad will not tip more than 60% from the level axis. Please note the self leveling can not be switched off - use the KK controller if this is an issue. 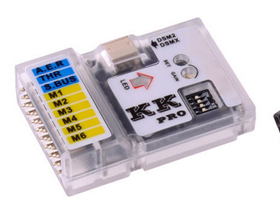 The KK pro flight controller is a built-in precise digital gyroscope and acceleration sensor, suitable for maneuvering flight. Besides all standard PCM and 2.4G digital receiver, It also compatiblr with S.BUS DSM2 and DSMX satellite. It has the most convenient way to bind the model and adjust the senser that allows you more time to enjoy the flight. This controller is great for beginners to medium experience who do not want to programme controllers.